Even though it’s taken for granted that you have to manage your own personal brand on the web, that still isn’t necessarily the case in the slower-moving world of academia. But it’s starting to happen, with individual brands beginning to eclipse the importance of being published in a well-known (and often exorbitantly expensive) journal. 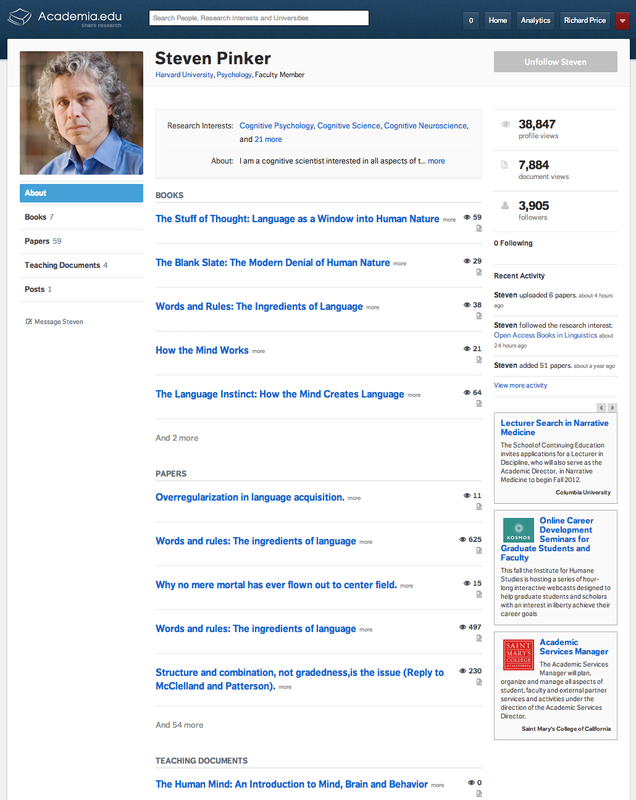 Academia.edu, a social network for professors and researchers, is taking advantage of this by overhauling its profile pages. The company’s CEO Richard Price says that academics are starting to want more of a direct connection with their audiences. So Academia.edu’s new profiles let researchers showcase their best work and track analytics on views and followers. Academics can now organize their research into different sections with places for published papers, drafts, book reviews and conference presentations. There’s also a new bio box at the top of the profile where they can show key career achievements. In addition, there is a section where they can link to their profiles on other sites like LinkedIn or Twitter. This all sounds very basic, like a standard set of features you’d expect in any consumer-facing web or mobile product today. But career advancement in a university or research setting is still very much tied to where you publish, not how much or how influential a following you have on a social network. He adds that every month, the site sees 4.5 million monthly unique visitors. That figure has grown by 30 percent in the last month. It’s growing fast enough where the site is starting to pick up on trending papers or research that is being actively discussed among members. Price said it’s often not the most recent paper that gets the most attention. The hope is that as the site grows larger and accumulates more network effects, it will democratize dissemination of scientific research. The company is backed with close to $7 million in funding from investors, including Spark Capital and True Ventures. It currently earns revenue through advertising and job listings.